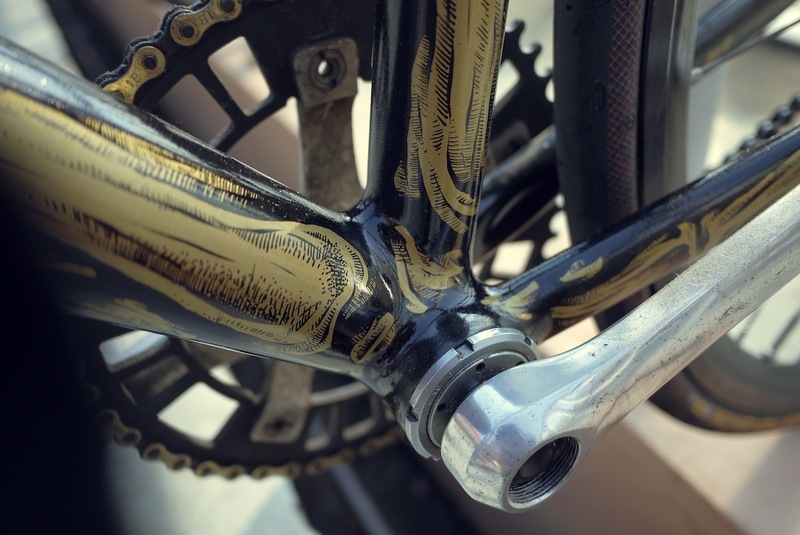 A couple years back, Pias Cycles ran a very limited batch of aluminium frame that we called the Devat. A tribute to our all time favorite track frame, the 90's Cannondale Track, the Devat frame took a couple design inspirations such as the 1" threaded fork/headtube combo and the mahoosive downtube. Kevin Oei, one of the few people who ordered the Devat, sent his frame to Paskalis "Mr. Kumkum" Kunang, a designer and artist who lived in Bandung. He's done a fantastic bone-themed free-handed artwork on this frame. I'm trying to find any bone-related jokes to wrote here, but I just can't came up with anything that sounds humerus. Okay, I'll show myself out. But before that, check out Gibranos' photos of this Pias Devat on his website.